Here is the list of the hotels near Sabadel-Latronquière. Book your hotel near Sabadel-Latronquière today, Thursday 16 May for the best price, reservation and cancellation free of charge thanks to our partner Booking.com, leader in on-line hotels reservation. Below here is the list the 50 closest hotels of Sabadel-Latronquière, sortable according your criteria. You will find the position of these accommodations on the Sabadel-Latronquiere hotels map. Gite du Mas duSuc is set in Bouxal and offers barbecue facilities. The property has garden views and is 44 km from Rocamadour. This holiday home is fitted with a living room and a fully equipped kitchen with a dishwasher and an oven. A flat-screen TV is available. The holiday home offers a children's playground. If you would like to discover the area, hiking is possible in the surroundings. Figeac is 23 km from Gite du Mas duSuc. Aéroport d'Aurillac Airport is 54 km from the property. House Prendeignes - 4 pers, 80 m2, 3/2 is located in Prendeignes. The accommodation is 47 km from Rocamadour. The holiday home comes with a TV. A dishwasher and a fridge can be found in the kitchen. Conques is 48 km from the holiday home, while Figeac is 18 km from the property. The nearest airport is Aéroport d'Aurillac Airport, 61 km from the property. House Prendeignes - 4 pers, 73 m2, 4/3 1 is located in Prendeignes. Guests staying at this holiday home have access to a fully equipped kitchen. The holiday home is fitted with a TV. Rocamadour is 48 km from the holiday home, while Conques is 47 km from the property. Aéroport d'Aurillac Airport is 59 km away. 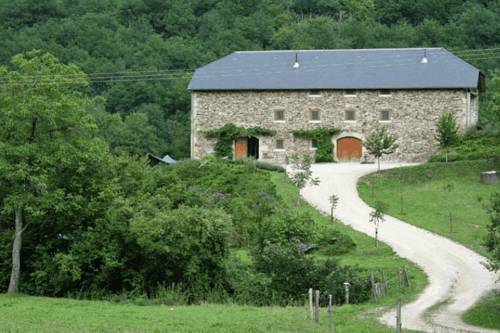 Located in Prendeignes in the Midi-Pyrénées Region, 48 km from Rocamadour, Ladonie offers a room in a private house. It boasts a sun terrace and views of the mountain. Free WiFi is provided throughout the property and free private parking is available on site. You will find a kettle in the room. Guests have access to a separate bathroom. Bed linen and towels are provided. Breakfast is available at an extra cost. There is a shared kitchen at the property. Conques is 50 km from Ladonie, while Aurillac is 65 km from the property. The nearest airport is Aéroport d'Aurillac Airport, 60 km from Ladonie. Located in Prendeignes in the Midi-Pyrénées region, House Prendeignes - 4 pers, 80 m2, 4/3 has a balcony. The property features garden views and is 46 km from Conques. The holiday home comes with a TV. The kitchen features a fridge. Figeac is 16 km from the holiday home, while Villefranche-de-Rouergue is 49 km away. Aéroport d'Aurillac Airport is 59 km from the property. Immersed in lush greenery, this family-run countryside retreat is ideal for a relaxing break, away from the hustle and bustle of city life. During the day you can relax by the outdoor pool, or explore the beautiful surroundings on bike or foot. In the evenings you can sample local produce used in the hotel restaurant, prepared on-site by the owner’s son. Hotel Restaurant du Tourisme is located in Latronquiere in the Midi Peyrenees region. It features its own fitness centre and offers affordable accommodation and free parking. Guest rooms at Hotel Restaurant du Tourisme have en suite bathrooms and are all serviced by a lift. A breakfast buffet is served daily. Guests at Hotel Restaurant du Tourisme can visit the nearby Lake Tolerme or enjoy leisure activities such as canoeing, rock climbing and fishing. House Saint-perdoux - 10 pers, 400 m2, 4/3 1 is located in Saint-Perdoux. This holiday home also has a private pool. The holiday home is equipped with a TV. The kitchen is fitted with a dishwasher and a fridge. Rocamadour is 45 km from the holiday home, while Conques is 50 km away. The nearest airport is Aéroport d'Aurillac Airport, 63 km from the property. Situated in Cardaillac, Grande maison a Cardaillac features accommodation with a private pool and free WiFi. This property offers access to tennis at the tennis court. The villa features 3 bedrooms, a TV and a fully equipped kitchen that provides guests with a dishwasher, an oven, a washing machine and a microwave. The villa offers a terrace. The property has a garden to relax in after a busy day, along with a water sports facilities. Rocamadour is 41 km from Grande maison a Cardaillac, while Figeac is 11 km away. The nearest airport is Rodez - Aveyron Airport, 66 km from the property. House Les gites de la grave is set in Cardaillac. Guests staying at this holiday home have access to a fully equipped kitchen. The holiday home comes with a TV. Rocamadour is 41 km from the holiday home. Rodez - Aveyron Airport is 65 km from the property. Ferme Lamalpapoche is a detached holiday home with a garden, located in Maurs. The property is 44 km from Rocamadour and free private parking is provided. Free WiFi is available . The kitchen is equipped with an oven. A TV is featured. Other facilities at Ferme Lamalpapoche include a sun terrace. Walk with llamas, ponies or alpacas on leads are available upon reservation for an extra cost. Guests can also have massages in the holiday home. Conques is 25 km from Ferme Lamalpapoche, while Aurillac is 30 km away. House Les gites de la grave is set in Cardaillac. The air-conditioned accommodation is 41 km from Rocamadour. The holiday home is equipped with a TV. The kitchen has a dishwasher and a fridge. Figeac is 9 km from the holiday home. Rodez - Aveyron Airport is 65 km away. House La ségaline 1 is situated in Saint-Hilaire. Guests staying at this holiday home have access to a fully equipped kitchen. The holiday home is equipped with a TV. Conques is 50 km from the holiday home. Aéroport d'Aurillac Airport is 34 km away. Two-Bedroom Holiday Home in St. Bressou is set in Saint-Bressou. Guests staying at this holiday home have access to a fully equipped kitchen. The holiday home comes with a TV and a living room. Rocamadour is 36 km from the holiday home, while Figeac is 15 km away. Rodez - Aveyron Airport is 70 km from the property. Two-Bedroom Holiday Home in St. Bressou is situated in Saint-Bressou. Guests staying at this holiday home have access to a fully equipped kitchenette. The holiday home is fitted with a TV, 2 bedrooms and a living room. Rocamadour is 36 km from the holiday home. Rodez - Aveyron Airport is 70 km away. Two-Bedroom Holiday Home in Le Bouyssou is situated in Le Bouyssou. Guests staying at this holiday home have access to a fully equipped kitchenette. The holiday home is equipped with a TV and 2 bedrooms. Rocamadour is 35 km from the holiday home, while Figeac is 14 km from the property. Rodez - Aveyron Airport is 70 km away. Guest accommodation Linac Preferred hotel ! Featuring free WiFi, a spa centre and a covered pool available all year long, Chambres d'Hôtes - La Ferme du Cayla offers pet-friendly accommodation in Linac, 42 km from Rocamadour. The bed and breakfast has a hot tub. Some rooms feature a seating area to relax in after a busy day. Views of the mountain, pool or river are featured in certain rooms. Bathrobes and toiletries are available on demand. Free use of bicycles is available at this bed and breakfast and the area is popular for horse riding and cycling. Conques is 24 km from the property, while Aurillac is 40 km away. This hotel is nestled in a chestnut grove near Maurs-la-Jolie, in the Cantal Region. It offers an indoor swimming pool, a spa and a fitness centre. Each room at the Village De Vacances La Chataigneraie Et Spa features a TV, a private bathroom and all rooms have a balcony. All rooms are equipped with free Wi-Fi access. The restaurant at Village De Vacances La Chataigneraie serves traditional French cuisine made with local produce. A self-service breakfast is provided daily. Free parking is available on-site. Activities at the Village include mini-golf and a tennis court. Guests can explore the Foissac Caves, which is 38 km and the Auvergne Volcano Park, 60km from Village La Chataigneraie Et Spa. Situated in Bagnac, Holiday Home Fromental offers accommodation with a private pool. This holiday home has a garden. The holiday home is fitted with a satellite TV and 5 bedrooms. The accommodation is equipped with a kitchen with a dishwasher and oven. Cycling can be enjoyed nearby. Conques is 32 km from the holiday home, while Aurillac is 48 km from the property. The nearest airport is Aéroport d'Aurillac Airport, 44 km from Holiday Home Fromental. Set in Maurs in the Auvergne region, Holiday Home Passerat has a balcony. The property is 34 km from Conques, and private parking is provided. The holiday home comes with 3 bedrooms, a TV and a fully equipped kitchen that provides guests with an oven. Aurillac is 41 km from the holiday home, while Figeac is 23 km away. The nearest airport is Aéroport d'Aurillac Airport, 38 km from the property. Located at Maurs-la-Jolie, in the Cantal, The hotel Le Plaisance welcomes you in a warm and friendly atmosphere. The hotel has 12 comfortable rooms. They are equipped with shower and toilets, television and Internet connexion. Some rooms have been renovated. The hotel features a restaurant offering a traditional cooking, as well as a bar and a terrace. Located in the centre of Maurs, Hôtel Restaurant Le Périgord offers luggage storage and a restaurant. The Causses du Quercy Regional Park is 40 km away and the hotel is situated at the crossroads of Cantal, Lot and Aveyron. All rooms feature a wardrobe, a desk and heating, while some have a TV and a private balcony. The en suite bathroom is complete with a bathtub and free toiletries. A continental breakfast is available each morning at Hôtel Restaurant Le Périgord. Guests can also sample traditional, regional food in the restaurant, which also offers meat specialties. The hotel can organise tour excursions of the area. Figeac is 23 km away. Hotel Saint-Étienne-de-Maurs Preferred hotel ! Located in Saint-Étienne-de-Maurs, Hotel La Chatelleraie features a seasonal outdoor swimming pool and a garden. With a terrace, the property also has a shared lounge. Free WiFi is included. All guest rooms in the hotel are fitted with a flat-screen TV. The private bathroom is equipped with free toiletries. The units feature a desk. Conques is 35 km from Hotel La Chatelleraie, while Aurillac is 39 km away. The nearest airport is Aéroport d'Aurillac Airport, 35 km from the property. On the fringe of the Cantal, Lot, and Aveyron departments, Maurs la Jolie boasts a micro-climate that lends it the mood of a village of the south. This easy access hotel accommodates guests in tastefully decorated bedrooms. Enjoy the comfort, simplicity and warmness of this familial hotel. You will be able to relax, unwind and experience the flavours and aromas of the region in our restaurant housed in a former barn with a veranda opening directly onto the natural surroundings. Ferienhaus Fons 400S is situated in Fons. Guests staying at this holiday home have access to a fully equipped kitchenette. Rocamadour is 36 km from the holiday home, while Figeac is 11 km from the property. The nearest airport is Rodez - Aveyron Airport, 67 km from Ferienhaus Fons 400S. House Gite 4 personnes is set in Camburat. Guests staying at this holiday home have access to a fully equipped kitchen. The holiday home features a TV. Rocamadour is 39 km from the holiday home. The nearest airport is Rodez - Aveyron Airport, 63 km from the property. House Camburat - 2 pers, 45 m2, 2/1 is set in Camburat. The accommodation is 39 km from Rocamadour. The holiday home comes with a TV. The accommodation is fitted with a kitchen with a dishwasher and a fridge. Figeac is 8 km from the holiday home, while Saint-Cirq-Lapopie is 46 km from the property. The nearest airport is Rodez - Aveyron Airport, 63 km from House Camburat - 2 pers, 45 m2, 2/1. Offering free WiFi and pool views, Holiday home Domaine de la Saule - 2 is an accommodation set in Fons. The holiday home has garden views and is 35 km from Rocamadour. This holiday home comes with a seating area, a kitchen with a dishwasher, and a satellite TV. The holiday home offers an outdoor pool. Barbecue facilities are at guests' disposal. Figeac is 12 km from Holiday home Domaine de la Saule - 2, while Saint-Cirq-Lapopie is 48 km from the property. Rodez - Aveyron Airport is 69 km away. Holiday home Domaine de la Saule is located in Fons. It features free WiFi and barbecue facilities. The holiday home features 1 bedroom, a TV with satellite channels and a fully equipped kitchen that provides guests with a dishwasher, an oven, a washing machine, a microwave and a toaster. The holiday home offers an outdoor pool. Rocamadour is 35 km from Holiday home Domaine de la Saule. The nearest airport is Rodez - Aveyron Airport, 68 km from the accommodation. Set in Le Sartre in the Auvergne region, Le Domaine Dans La Prairie features a garden. This holiday home offers free WiFi, water sports facilities, as well as a tennis court. This holiday home has 2 bedrooms, a TV, and a kitchen. The holiday home offers an outdoor pool. Le Domaine dans prairie provides a terrace. Conques is 47 km from the accommodation, while Aurillac is 33 km away. The nearest airport is Aéroport d'Aurillac Airport, 29 km from the property. With garden views, House L'enaurada has accommodation with a kitchen located in Figeac. Rocamadour is 37 km from the holiday home, while Conques is 30 km away. The nearest airport is Aéroport d'Aurillac Airport, 43 km from the property. Boasting accommodation with a balcony, House La bergerie de seyrignac is a holiday home situated in Lunan. Guests staying at this holiday home have access to a fully equipped kitchen. The holiday home is equipped with a TV. There is a bathroom with free toiletries. Rocamadour is 41 km from the holiday home. The nearest airport is Rodez - Aveyron Airport, 40 km from the property. Boasting a private pool and garden views, House Sokevinia is situated in Saint-Bressou. Guests staying at this holiday home have access to a fully equipped kitchen. The holiday home comes with a TV. Rocamadour is 30 km from the holiday home, while Figeac is 17 km away. The nearest airport is Aéroport d'Aurillac Airport, 67 km from the property. Below here is the hotels map of Sabadel-Latronquière. Names and details of Sabadel-Latronquière hotels can be shown on the map clicking on the prices icons.